BE SEEN! 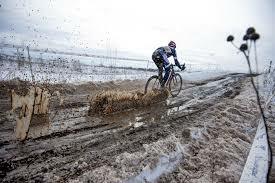 People often don't expect to see cyclists in foul weather. Use front white and rear red lights and reflective tape and/or clothing to make sure you can be seen from the front, side and back. A disproportionate number of bicycle/car crashes happen in the dark!! Just because we can see motorists, doesn't mean they see or expect us. And during the season of long nights, cyclists are often invisible in the canyon of shadows created by street lights and car headlights. Not convinced? Check out CDOT's clever "can you see the cyclist" video. Know the Hazards: The streets are slickest when it first begins to rain or snow. Manhole covers, leaves and metal bridges are particularly dangerous when wet. Plowed snow reduces operating room on the roads. Fresh snow makes traction difficult. Black ice is sneaky; all ice can be upending. And then there are regular ole hazards--potholes, cracks and RR crossings. Your awareness of these hazards, especially on your common routes, will help you anticipate and handle them (see below). Know the Tricks: When it is wet or icy, pump the brakes, ride more slowly, keep your weight on the back wheel, and don't lean into turns as much. 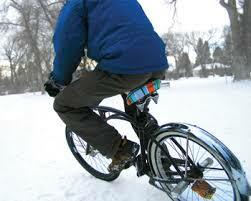 When it snows, follow the ruts created by cars, avoiding ridges which can deflect the front wheel and cause a spill. Again, keeping your weight to the back helps with stability. Breathe deeply, stay the course and keep pedaling--your bike wants to stay upright, and momentum will help it. If you do start to fall, try to lean away from traffic and resist putting out your hand to brake the fall; it’s often better to take the impact flat along your forearms. There’s also no shame in walking with your bike through rough patches. Know your Options: Many of us are creatures of habit, taking the same route to a given destination. During messy weather, consider alternates. After a snowstorm, an unplowed side street where cars are poking along at 15 mph might be better than an icy artery where cars are sliding across the road at 40 mph or more and the bike lane is buried under plowed snow. Then again, during a storm, large arterials are sometimes best because cars are slow and the heavy traffic. First, consider the rule of layering. This is a technique of wearing varying weights of clothing designed to wick, trap, hold and block. The overall purpose of layering is to trap insulating air between layers of clothing and subsequently hold heat in. Wear a lightweight, high-performance, polyester-based wicking fabric next to the skin. Several manufacturers produce excellent high-quality, high-performance fabrics that are designed for cyclists. This type of garment will wick moisture away from the skin, keeping your skin and clothing dry to avoid heat loss through evaporation. Next, wear something with thermal capabilities (polyester is excellent here as well) that retains warmth while allowing a slow "breathing" process of the fabric. Modern synthetic fabrics like polyester breathe and will help you stay warmer longer. The outer garment will serve two purposes: Hold warmth in, while blocking the cold air and wind. The outer garment should serve as thermal barrier as well as a wind block, since cycling through cold air increases the wind chill factor. Fabrics like nylon serve this purpose well. Natural fabrics like wool and cotton get wet and stay wet, so don't wear your cotton T-shirt next to your skin thinking it will act as the primary wicking garment. Also, if you're riding without a windbreaker and find that you need one, insert sections of a newspaper inside your cycling jersey. Insert it in the front to block on-coming cold air, and in the back to conserve core body heat and act as an insulator. You'll see amateurs and pros alike using this technique on long, cold descents. About 30 percent of the body's heat is lost through the head. A tremendous supply of blood circulates through this area, so if you keep your head warm, your body will stay warm. Depending on the severity of the cold, differing levels of head gear can be used. Ear bands or ear warmers are a good beginning. A scull cap of synthetic fabric is a good lightweight remedy. winter time on a trail/woods. Think Survival and what do you need to make it through a cold night. Bicycles in many States are considered vehicles, and cyclists have the same rights and the same responsibilities to follow the rules of the road as motorists.